I really enjoyed this collection. The last story was my favorite. Really nice collection of short stories. My Boys - Story is pleasant and nothing more; title says it allTessa's Surprises - A heart-touching little story; perfect for reading during these holidays!Buzz - Ingenious and the sort of story I would write; Buzz is a (view spoiler)[fly (hide spoiler)]The Children's Joke - My favourite among this bunch; ALL parents should do this at least onceDandelion - Perfect little hopeful story to lift your mood; can't say there wasn't something in my eyeMadam Cluck and Her Family - Most entertaining, especially if you live on a farm. like me.A Curious Call - Very curious story and not very well explained... very curiousTilly's Christmas - The kind of story that squeezes your heart and makes you cry. a little.My Little Gentleman - Same as aboveBack Windows - very humorous and ehmm... relatableLittle Marie of Lehon - Sweet and savouryMy May-day Among Curious Birds and Beasts - made me want to visit a zoo right awayOur Little Newsboy - heart-touching-warmingPatty's Patchwork - What wouldn't I give to have an aunt like Patty's? A mixed up bag of heart warming stories and just a bit of memento's fro Aunt Jo. The author is known for the little women series and this is similar. 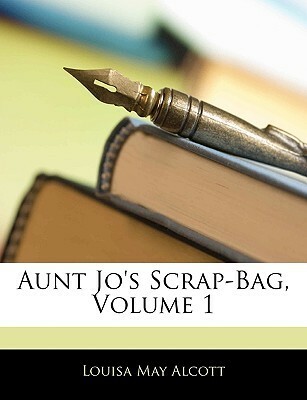 This is as the title says, a scrap-bag, or collection of short stories, including an autobiographical one where Alcott describes the original inspiration for Laurie in Little Women. If you are a fan of Little Women, then this would interest you! A charming mix of LMA's reminiscences over "her boys", some observations and some short stories she penned. If you loved the "Little Women" series or "Rose in Bloom" you may notice some common themes, and will probably enjoy this little book too. For fans of Little Women and Louisa May Alcott, or if you just love short, sweet stories, this is for you. Here's a few descriptions of some of my favorite stories found in Aunt Jo's Scrap Bag.I enjoyed “My May-Day Among Curious Birds and Beasts” in which the narrator sweetly tells of the sights of a visit to the Zoological Gardens in London. It is obviously based on Louisa's own travels. I think it would make for a delightful read-aloud to children, since there are lots of interesting animals that make an appearance in the story.One story that is just so comical, just so demure, and a bit too fun, is “The Children's Joke”. My, my. What a laugh, what a riot. Two children get to play the part of the parents all day long, while the parents must be subjected to play the part of children. Each side learns big truths about the other, and that sometimes life is less stressful when you just do the best you can in the life you're given. I actually was reading this short story collection Aunt Jo's Scrap Bag while I simultaneously was reading a biography on Miss Alcott, entitled Invincible Louisa, and it was perfect timing! I kept seeing so many parallels between Louisa's own life and the stories she was writing. Most of her stories pulled in so many details of what was happening with her and the rest of the Alcott family in real life. It was fantastic to see the similarities!In the story “My Boys” Louisa writes of several boys who left an impressionable mark on her life. In it, we see she is starting to sketch out the character of beloved Laurie, though in this early story he is named Laddie. (I actually learned more of the history behind Laurie's character in Invincible Louisa, wherein the reader gets to meet the actual boy who both Laddie and Laurie are based on. (Pretty cool stuff can be found in history and literature, eh? )Although not exactly a favorite, “Madam Cluck and Her Family” stands out to me, as it was a strange and grave sort of story. It's starts with this delightfully misleading line: “There never was a prouder mamma than Madam Cluck when she led forth her family of eight downy little chicks.” The story progresses as each of the chicks dies off in some unfortunate way. A comically grim and rather surprising plot choice, coming from Miss Alcott.Overall, a delightful batch of stories that I greatly enjoyed!Book #1 finished for the Louisa May Alcott reading challenge, found at inthebookcase.blogspot.com. This is a collection of several short stories; some of them were a bit odd to read. However, I did have a couple favorites: there was "The Children's Joke" was about a brother and sister who switched roles with their parents for a day. This was a hilarious read.Another of my favorites was "Tessa's Surprises". It was a story about a little girl who wanted to be able to make a few coins and buy her younger siblings Christmas presents. I thought that this was a good holiday story. Mixture of stories - some bittersweet, some a little twee, some funny. Some are fiction, some are observational autobiographical pieces. If like me you want to read everything LMA wrote in order to find out more about her, this will definitely have something of interest for you. Eh--2.9? The stories are nice, but not really profound. There's nothing wrong with them, but there's not really anything to grip you either. They are very, very moralistic. By the end I did feel like she was waxing quite Dickens-esque (which is a compliment, in my opinion) in depicting the sad plights of poverty-stricken children. This is both pretty neat and very sobering. I can't believe that finding a newspaper boy freezing on a doorstep was normal at the time. 66 stories not 36!!! wow on and on and on, finally fliped through rest of book, stories are all with a moral or example of how a child should be or not be, probably great in the time it was written, but guess i am not into retro books like this if i was on a desert island probably would have read it all word for word!!! stuck with it in case i was ever on a game show !!!!! A collection of short stories. Some appear to be completely fictional while others appear to be factual. My favorite was the one where she described all her favorite boys and especially gave insight into how she created the character Laurie. It was okay. Some of the stories were really sweet, and it was easy to read. But they kind of got repetitive towards the end--all about poverty and kindness and so on. Good message, but not very exciting after a while. A collection of short stories supposedly written by Jo March (Little Women) while she lived in the city. It was a sweet collection of stories meant to be told to children. Not a whole lot of substance, but an enjoyable way to spend some time. Dated but happy little stories, including one that appears to be the inspiration for the characters of Laurie and Jo in Little Women (Cupid and Chow-Chow). A collection of short stories by Louisa May Alcott. My favorite was Patty's Patchwork. I love anything by Louisa May Alcott. And this book of short stories does not disappoint. Got bogged down and couldn't make myself finish it. May take it up again someday, who knows. Louisa May Alcott - As A.M. Barnard: Behind a Mask, or a Woman's Power (1866)The Abbot's Ghost, or Maurice Treherne's Temptation (1867)A Long Fatal Love Chase (1866 – first published 1995)First published anonymously:A Modern Mephistopheles (1877)Louisa May Alcott was born in Germantown, Pennsylvania on November 29, 1832. She and her three sisters, Anna, Elizabeth and May were educated by their father, philosopher/ teacher, Bronson Alcott and raised on the practical Christianity of their mother, Abigail May.Louisa spent her childhood in Boston and in Concord, Massachusetts, where her days were enlightened by visits to Ralph Waldo Emerson’s library, excursions into nature with Henry David Thoreau and theatricals in the barn at Hillside (now Hawthorne’s "Wayside").Like her character, Jo March in Little Women, young Louisa was a tomboy: "No boy could be my friend till I had beaten him in a race," she claimed, " and no girl if she refused to climb trees, leap fences. "For Louisa, writing was an early passion. She had a rich imagination and often her stories became melodramas that she and her sisters would act out for friends. Louisa preferred to play the "lurid" parts in these plays, "the villains, ghosts, bandits, and disdainful queens. "At age 15, troubled by the poverty that plagued her family, she vowed: "I will do something by and by. Don’t care what, teach, sew, act, write, anything to help the family; and I’ll be rich and famous and happy before I die, see if I won’t! "Confronting a society that offered little opportunity to women seeking employment, Louisa determined "I will make a battering-ram of my head and make my way through this rough and tumble world." Whether as a teacher, seamstress, governess, or household servant, for many years Louisa did any work she could find.Louisa’s career as an author began with poetry and short stories that appeared in popular magazines. In 1854, when she was 22, her first book Flower Fables was published. A milestone along her literary path was Hospital Sketches (1863) based on the letters she had written home from her post as a nurse in Washington, DC as a nurse during the Civil War.When Louisa was 35 years old, her publisher Thomas Niles in Boston asked her to write "a book for girls." Little Women was written at Orchard House from May to July 1868. The novel is based on Louisa and her sisters’ coming of age and is set in Civil War New England. Jo March was the first American juvenile heroine to act from her own individuality; a living, breathing person rather than the idealized stereotype then prevalent in children’s fiction.In all, Louisa published over 30 books and collections of stories. She died on March 6, 1888, only two days after her father, and is buried in Sleepy Hollow Cemetery in Concord.